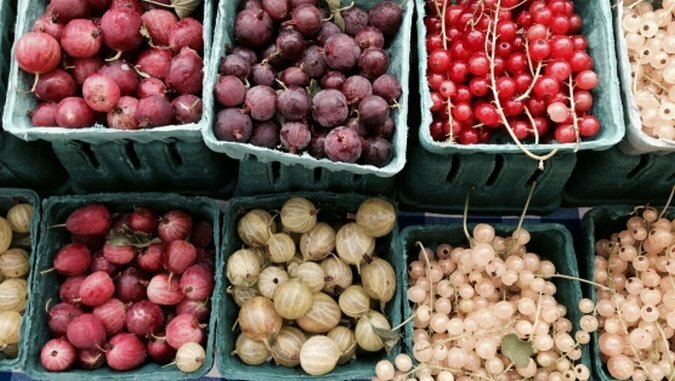 Gooseberries and currants from Three Springs Fruit Farm, a seventh-generation family farm in Aspers, Penn. “We really try to go for the off-the-wall type things,” said Lauren Hebel, who has worked at Three Springs for five years. Colleen and Michael Hilston became interested in farming through their children’s participation in 4H. Today, they own Shepherd’s Manor Creamery in Mt. Airy, Md. At Maryland’s first sheep dairy, Colleen combines her interest in agriculture and cooking, making sheep’s milk cheese as well as soap, pictured here. In addition to stunning produce, like this brightly colored rainbow chard, The Farm at Our House in Brookeville, Md. provides job-training opportunities for at-risk young men. The farm is an offshoot of Our House, a nonprofit residential program for abandoned, abused, homeless and orphaned teenage boys. Plenty of market visitors stop by Evensong Farm’s table for eggs, beef, pork and charcuterie. But even more can be seen walking around with a cup of Urban+Ade, lemonade made from the herbs grown at Evensong. Owner Julie Gray Stiner creates refreshing seasonal combinations like red basil and tarragon, lavender and lemon balm, and sage and mint. Country Pleasures Farm was the first certified organic orchard in the state of Maryland. Up-to-the-minute seasonal produce is available. Summer boasts peaches and apricots, black raspberries, blueberries, and delicate lavender. Blue Ridge Dairy Co. began in 1999 as a 10-acre, one-cow farm in Lovettsville, Va. Now located in Sterling, Va., owners Paul and Alison Stephan and their staff create handmade butter, yogurt and cheese, including creamy burrata, 90-day aged feta, and probiotic Greek-style yogurt. These scalloped oyster mushrooms from North Cove Mushrooms in Madison County, Va. look like under-the-sea plant life. In addition to selling fresh mushrooms, North Cove customers can buy handmade ravioli, mushroom tintcures and Reishi remedy tea. Capitol Kettle Corn capitalizes on the DC-adjacent location with politically inspired sweet and salty popcorn, including Filibuster (buttered), Camelot (caramel), POTUS (spicy hot chocolate), and First Lady (brown sugar, pictured here). Bright green pea shoots from Chicano Sol, a certified organic family farm in Blain, Pa. At the Silver Spring Farmer’s Market, Chicano Sol is the go-to destination for microgreens. “Movin’ to the country… gonna eat a lot of peaches…” It’s hard to avoid flashing back to ‘90s Top 40 at the sight of crates of gorgeous, sweet peaches from Spring Valley Farm and Orchard in Slanesville, WV. Spring Valley was recently GAP (good agricultural practices) certified in food safety by the USDA. A veritable rainbow of produce, from Rich May peaches to purple cauliflower to milky sweet corn, can be found. At Banner Bees, the Langworthy family creates flavored and enriched honey, royal jelly, beeswax candles, and honey and beeswax-based body products. In addition to donating 10 percent of proceeds to the Maryland State Apiary Inspectors Fund, Banner Bees keeps hives at Red Wiggler Community Farm, a nonprofit dedicated to providing gainful employment to adults with developmental disabilities. Since 1978, Spiral Path Farm has been owned and operated by the Brownback family in Perry County, Pa. Three generations grow and pick certified organic produce, like these sweet carrots, for farmers markets and CSA boxes. For aspiring young farmers, Mike and Terra Brownback established the Arias M. Brownback Future Farmer Scholarship, in memory of their son. Soaps, lotions and potions are created at Belle’s Acres Farm in Cecil County, Md. Most products have a goats’ milk base, and all animals are free range. The eye cream, made with coffee extract, makes tired eyes look more awake. Guests are invited to stay at Quaker Valley Orchard, a 230-acre family-owned farm in the Adams County, Pa. fruit belt. In addition to tart cherries, juicy peaches, jams and more, blue and yellow corn is dried, sold and popped in paper bags for a crunchy treat. The Kauffman family of Garden Path Farm in Lancaster County, Pa., raise grass-fed cattle, sheep and poultry for every cut of meat imaginable. And they never forget their furry pals, offering hickory smoked bones for man’s best friend. Market-goers stop and linger by the Mock’s Greenhouse table to sample from bowls of colorful, hydroponic cherry tomatoes, and pick up a pint. Along with 30,000 pounds of tomatoes each year, Mock’s also features lettuce, watercress, arugula and herbs (basil and cilantro). This green and yellow zephyr squash from Love Dove Farms has a sweet, nutty flavor. Love Dove is run by John Dove, a fourth-generation farmer in Howard County, Md., and his fiancée, Courtney. Tobacco once grew in the fields at Suttler Post Farm, where John and Judy Mast now cultivate bright sunflowers, zinnias, gerberas and other colorful blooms for stunning bouquets. It’s all about fermentation at No. 1 Sons, where one can find a range of pickles, krauts, kimchi and other specialties created from local produce. Pictured here: sweet and tangy Masala Cider Beets, made with apple cider vinegar. Just across the Washington, DC border is Silver Spring, an unincorporated city in Montgomery County, Maryland. Home to the Discovery Channel, the American Film Institute Silver Theatre, and an ever-growing collection of creative entrepreneurs, Silver Spring is far from your typical strip mall suburb. Each Saturday, the center of the downtown business district is blocked off and filled with produce vendors from throughout the Chesapeake Bay watershed in Maryland, the District of Columbia, Pennsylvania, Virginia and West Virginia. The downtown Silver Spring market is part of FRESHFARM Markets, which strives to provide education in matters of local food, environmental issues and economic growth for local farmers. The markets also participate in SNAP dollars and gleaning programs, in which (often misshapen) produce that cannot be sold is donated to food banks throughout the region. The market is rife not only with rich seasonal produce, artisan food products, baked goods and pasture-raised meats, but with stories. Each farm has a unique history and place in the community. Holly Leber is a writer and editor based in Silver Spring, Md. When she’s not hunting for stories, she can be found going on produce-related shopping sprees, making jam, wine tasting and reading 1930’s Nancy Drew. Holly is the editorial director of The Daily Do Good.